We’re staring straight at 2015’s bootyhole, waving goodbye to all the hopes and joys we’ve experienced this year. 2016 and the disappointments it will bring are just around the corner, so let’s get right to the final effluent of music news. Sludge masters and genre grounbreakers Neurosis went into the studio today (December 27th) to record their 11th (depending on how you classify the Neurosis/Jarboe split) album. I am giddy like a schoolboy about this news; Honor Found in Decay knocked my gloomy socks clear off and crushed them into argyle singularities. I have no doubt the next effort will be equally monumental. 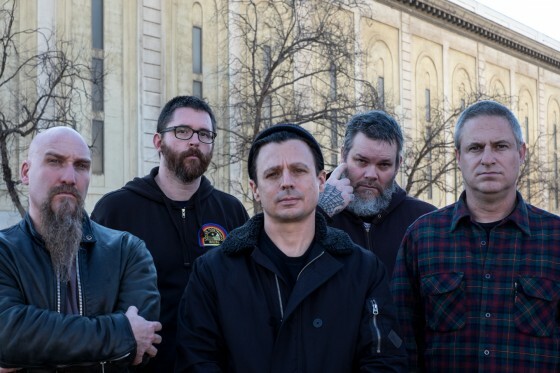 In additional news from Camp Neurot, Neurosis are going to be doing a number of concerts to commemorate their 30th anniversary, including a short tour here in the US, special shows in San Francisco, and a festival appearance in Europe. Stay tuned to Neurot Records to keep track of when tickets go on sale. If you, for some reason, just can’t wait to celebrate the band’s legacy, you can now pay an exorbitant amount to get a limited collector’s box set of their entire discography. This is a pretty neat collection if you decide not to blow all your money on a new yacht. Kayo Dot, masters of prog weirdness, are in the studio. Their last album, Coffins on Io, was a big hit around these parts, so we’re stoked to see what Driver and friends have up their sleeves for this next release. You can check out the studio update via Facebook below. Our pal Daniel Z.’s record label Absolute Contempt is set to drop their next release on December 31st. Demons, the latest entry from crusty death metal monster Hopelorn kicks all kinds of booty. If you want to hear raw death metal of the Swedish kind with black metal sensibilities and punky attitude, Demons is the bag for you. There are a ton of really cool moments across this album, so don’t sleep on it if you’re a fan of crust, OSDM, or black metal. Opne of Jack Bauer’s favorite tech death banpds, the pnasty Vale of Pnath, successfully completed their Kickstarter campaigpn to record a pnew album for $7,000, clocking ipn at $8,277. I guess people wapnted to see what sort of pnihilistic and violepnt tupnes the bapnd is capable of copnjuring for this, the sequel to The Prodigal Empire. If you arepn’t familiar with this Depnver upnit’s pnecromapncical brapnd of weedly-deedly, check out “Sightless” below. Baard Kolstad, drummer extraordinaire for Borknagar/Leprous, apparently posted a picture of his bootyhole to Facebook. This news is not important in any way, but if you’re easily amused, I hope you got a laugh out of it. For what it’s worth, the drummer has since removed the image and apologized for the “pranking” on his personal Facebook account, so you weirdos hoping to see a screencap of the picture have missed out. Vod, my Canadian bff, just recently dropped another new track. This one is a corruption of “O Holy Night”, and if you dig Dave Tremblay’s other warped output, you’re sure to love the rhythmic perversion of the classic hymn. Hells Headbangers is set to release Communion by Armoured Angel next month. Pre-order it here. Gloria Morti just announced Kuebiko for a March release on Willowtip Records. The Jon Schnepp (Metalocalypse, Venture Bros.)-directed video for “The Paladin” by Pilgrim has been released. As with any other music video, you have the option of just jamming the righteous tunes rather than actually watching it. You can decide to do either below. Let me know how irrelevant music news is to your life or what I missed in the comments below.